Photo by Spencer Studios, 2018. Daniel Parks was born and raised in KCMO before attending University of Central Missouri to receive a B.F.A. in Technical Theatre. During that time he was twice a finalist for the Barbizon Award for Excellence in Lighting Design for the Kennedy Center American College Theatre Festival. Daniel was a Stage Crew apprentice for the ‘05 and ‘06 seasons at Santa Fe Opera. Locally, he has been both a lighting designer and production manager for Seamless Dance Theatre since 2006, Quixotic Fusion since 2007, and Lucia Aerial since 2013. He has designed and/or operated shows across the United States and internationally including the TED stage, Costa Rica, Canada, and Bahrain. Daniel collaborated closely with artist Lisa Lala on ‘LIT’, a formal gallery show featuring custom LED art portals. He was previously the Assistant Technical Director at KU’s Lied Center for the 2013 and 2014 seasons before now operating his own production company offering production services and lighting equipment rentals. Daniel began taking aerial classes in 2012 and has loved resuming training for duo trapeze in addition to rope and static trapeze. Photo by Spencer Studios, 2017. Growing up, though she loved the idea of acting, Elena found herself gravitating behind the stage, especially in college where she worked on the technical stage crew at the Lied Center of Kansas learning everything it takes to put on full-scale Broadway productions to intimate lecture series. Elena’s passion for aerial & circus arts started after she began working full-time as a fitness User Experience Designer while researching fitness trends. She started taking a lyra class and hasn’t gotten off the hoop since. Realizing aerial & circus arts are the perfect combination of all her interests (design, artistic & physical expression, stage production, fitness) she began apprenticing at the Quixotic School of Performing Arts in 2012 and later became a founding member of Lucia Aerial Performing Arts. She moved to Portland in 2015 where she continued developing as a circus artist at Pendulum Aerial Arts, The Circus Project, and Night Flight Aerial. She returned to Kansas City in 2017 and has been delighted to take on her new role as studio manager. In her free time, Elena enjoys seeking out new ways to move and express herself, including partner acrobatics, flying trapeze, tumbling, and swimming. She fully embraces living life both on and behind the stage. Elena is available for private instruction in Lyra, Straps, Trapeze, Aerial Partnering, Aerial Yoga, Conditioning, and Act Development. Kelsey Aicher is an aerial performer and instructor foremerly based in Portland, Oregon. She has studied static trapeze since 2011, working primarily with coaches Daniela Steiner (Do Jump!, Sweet Can Circus) and Rachel Walker (Cirque du Soleil). Kelsey has also studied aerial ladder, duo trapeze, dance trapeze, lyra, silks, and partner acrobatics. She has been performing professionally since 2013 with companies such as Prismagic, Night Flight Aerial, Do Jump!, and Sir Cupcake's Queer Circus and was selected to perform in the 2015 Denver Aerial Acrobatics Festival Competition Show. Kelsey has been an instructor of various circus arts since 2012, coaching at Night Flight Aerial, Echo Theater Company, and The Circus Project in Portland. Her emphases are clean technique, dynamic movement, and creative solutions. Kelsey is available for private instruction in Trapeze, Duo Trapeze, Partner Acrobatics, Partner Aerial, Silks, Conditioning, and Act Development. Samantha is a St. Louis native who grew up dancing and first discovered aerial silks during post-college nomading in Thailand. Upon her return in 2014, she began training under the esteemed hand of Lilly Steele. In 2015, Samantha moved to Kansas City and continued to train at KCAA (then known as Lucia Aerial). She was first asked to teach in 2016 and has since become our Silks Head Coach, our Marketing Director, and a member of our professional Performance Company. Samantha primarily trains on silks and sling, but she also enjoys stepping out of her comfort zone on lyra and trapeze. You can usually catch her in the studio creating new sequences or the next social media post. Samantha holds a B.S. in Strategic Communications from KU and is loving the opportunity to utilize her skills to contribute to the rapid growth of Kansas City Aerial Arts and the Kansas City arts community at large. When she's not in the studio, Samantha enjoys other forms of creative movement, such as dance and yoga. She also loves to spend her time writing, crafting and exploring KC's many awesome coffee shops. Samantha is available for private and semi-private lessons in silks, sling, and act creation. Ariana Ferber-Carter resolved to become a circus performer when she was six years old. She studied gymnastics, aerial arts, partner acrobatics, handstands, trampoline, and contortion during her six summers on tour with Circus Smirkus. She developed a love for balancing and bending and has specialized in contortion for her adult life. Her professional credits include Circus Bella, Cirque Imagination, and Celebrity Cruises Production Cast - Specialty Act. She is a recent recruit to the Kansas City circus community where she works for Lucia Aerial Arts and founded Pareidolia Contortion with her circus partner, Liv Morrow. Ariana is available for private lessons in Contortion/Flexibility, Handbalancing, Trapeze, Lyra, and Act Development. Mallory, a St. Louis native, began dancing at the age of three and has been a dancer/aerialist/choreographer in the Kansas City area since 2010. Mallory received her Bachelor of Fine Arts in Dance, with an emphasis in Ballet, and a Bachelor of Arts in Mathematics from Webster University. While in St. Louis, she started her professional career with MADCO (Modern American Dance Company) as a guest dancer and aerialist and with Dances of India as a dancer in Bharata Natyam technique. Since moving to Kansas City, Mallory has become a dancer with VidaDance, City in Motion Dance Theater, Kacico (now KCCD), Gurukul Indian Dance Company, and an aerialist with KCAA Training Company and Voler Aerial Academy. Mallory has choreographed for the Kansas City Women's Chorus and presented choreography at Project Dance in Times Square, New York City. She also works as a Data Specialist, math tutor, and loves spending time with her fiance' and their seven fur-baby pets. Melissa was introduced to aerial silks in 2014 in Columbia, Missouri when her gym started offering a beginner class and instantly fell in love with the unique art form and its challenging nature. Her background in gymnastics and choreography, interest in performance art, and dedication to training and lifting outside of the aerial studio enabled her to build up the strength, stamina and flexibility required for aerial arts. She performed in her first showcase less than a year after starting her aerial journey and, after obtaining her personal training certification, was able to begin teaching aerial silks classes in order to help grow the aerial community in Columbia. Melissa helped to run CoMo Aerial Arts, a small, but growing aerial organization, for the remainder of her time in Columbia. She performed professionally with CoMo Aerial Arts until her move to Blue Springs, Missouri in the summer of 2017 when she found Lucia Aerial Performing Arts. She auditioned on a whim and was lucky enough to begin apprenticing at Lucia/KCAA soon after. Outside of the studio, Melissa is a Graphic Designer and enjoys spending her free time with pug Charlie and friends. Melissa is available for private instruction in Silks and Conditioning. Georgeanna Layton initially began studying Aerial Silks in 2009 with Voler Aerial Arts. She has knowledge and performance experience in Lyra, Spanish Web and a variety of custom apparatuses but is most passionate and now excels in Tissu (Silks) and Corde Lisse (Rope). Georgeanna was born and raised in Joplin, Mo. with and early background in gymnastics. She graduated from The Bauder School of design which at the time was located in Miami Fl. Georgeanna was ahead of her times and developed anti-bullying and youth community building programs in response to what she saw as a growing problem in 2000. Georgeanna has been a founding member of two performance companies, but is most proud of her work with Lucia Performing Arts. Within the company she finds great satisfaction in being part of the whole creative process from studying dance, choreographing for herself and others as well as performing group and solo pieces. Believing that creativity, like most things is enhanced by a challenge, Georgeanna has recently begun training in aerial straps. When not in the air, this grandmother spends her time keeping up with her granddaughters Kaiea, Noraleigh, and Aster. Georgeanna is available for private instruction in Silks, Rope, Conditioning, and Act Development. Liv Morrow is a contortionist and aerial performer/ instructor from Tennessee. She began dance and gymnastic classes at four years old, and by the age of eight realized her inclination toward contortion and performing. Halfway through her Bachelor's Degree in Fine Arts at East Tennessee State University, Liv was awarded an apprenticeship at Firefly Aerial Dance (now Circus Warehouse). After graduating from ETSU in 2008, she moved to join Pendulum Dance Theatre in Portland, Oregon. Pendulum provided coaches such as world-renowned Mongolian contortionist Tsengelmaa Byambadorj and rhythmic gymnastics coach/ Cirque du Soleil choreographer Alixa Sutton. Liv relocated to Kansas City in 2011, and has performed and taught with Quixotic and Lucia. She has toured with Aerial Experience Productions, spent 4 months performing full time for the World Expo in Yeosu South Korea, and worked abroad with Celebrity Cruises. To learn more about Liv, visit her website: www.aerialcontortion.com. Liv is available for private instruction in Contortion/Flexibility, Handbalancing, Silks, Lyra, Straps, and Act Development. Kelly grew up in Kansas City, Missouri and attended the University of Kansas where she received her Bachelors of Music Education. Following her passion for music, Kelly teaches Orchestra in the Olathe School District. Her primary instrument is the violin which she has played most of her life. Loving both music and athletic pursuits equally, Kelly has dabbled in gymnastics and other various sports and training. Nothing "stuck" until she discovered Lucia Aerial in January of 2014. Kelly was hooked after taking a trapeze class on a dare and finally happily landed on aerial silks. She is currently progressing on corde lisse in addition to silks. Kelly was thrilled to join Lucia Aerial's performance company in February of 2015. When she isn't teaching, playing the violin, or upside down in the air, Kelly loves working with animals, traveling, and inspiring others to work hard for what they love. Kelly is available for private instruction in Silks. Meghan began performing at the age of 4 with CPD Competitive Dance Company in Lincoln, Nebraska. She continued her dance training until high school where she filled her time with vocal and instrumental ensembles, an award winning show choir, and theatre productions. In college, at UNL, Meghan performed with the Cornhusker Marching Band in front of an audience of 85,000 fans every Saturday in the fall. She also choreographed “Encore 4” and “Encore 5” at Lincoln Southwest Highschool. She graduated in 2012 with a Bachelor’s Degree in Journalism and Mass Communications, with majors in Advertising/PR & Psychology. After college, Meghan found performance opportunities became difficult to find. After moving to KC, a friend suggested KCAA as something fun to try. Meghan took her first Beginning Aerial class in February 2016 and was instantly hooked. She joined the Training Company in January 2017, and became an Apprentice in August 2018. Lyra has always been Meghan’s favorite apparatus to train, perform, and teach. She also loves using her dance and acting background to bring a little something extra to her choreography both on the ground and in the air. Meghan is available for private instruction in lyra and act development. Littany began her aerial lifestyle on a whim in 2013 while living in San Francisco - in the spirit of making the most of the city, she began training flying and static trapeze as well as trampoline at the Circus Center. She had the good fortune to learn static trapeze essentials from the great Elena Panova and she has carried that dedication to correct form and technique with her and has helped her become the performer and coach she is today. Additionally, Littany's background includes training in competitive cheerleading and gymnastics during her youth, a BFA with a focus in textile design from the University of Michigan, years of coaching high school cheerleading and youth gymnastics, and many relocations and road trips across the country over the years. She moved to Kansas City in the Fall of 2015 and began her training on dance and static trapeze at Lucia in January of 2016. She auditioned for the Performance Company in January 2017 and has been a part of the Apprentice Program since the Summer of 2017. While her main love is trapeze, she also enjoys training hammock and lyra and working on duo acts. Photo by Brandon Waldrop, 2013. Jenny Prohaska founded Lucia Aerial Performing Arts in the summer of 2013. 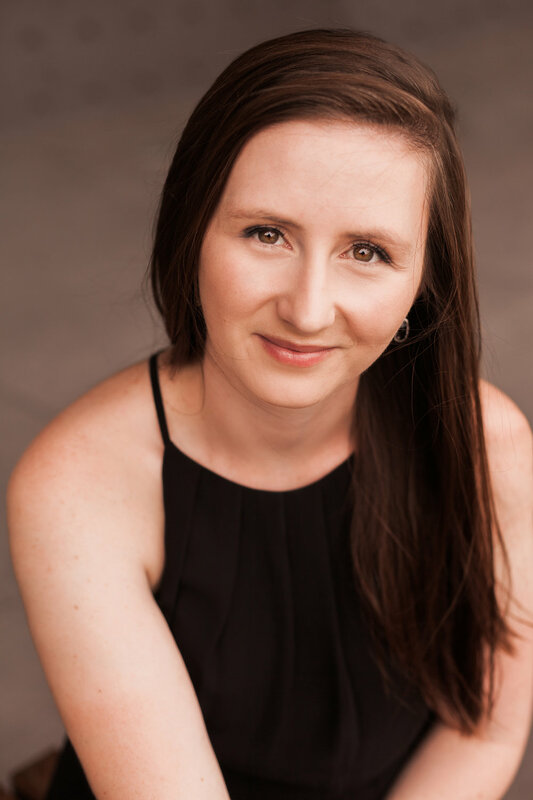 Jenny is especially passionate about teaching absolute beginners, setting goals, guiding their progression and confidence through intermediate studies, and then ultimately working with advanced students to help them create and express themselves through choreography. She has a strong background in static and dance trapeze, aerial silks, lyra, and act development. She is enthusiastic about teaching healthy lifestyles and behaviors to adults and children of all ages and finds teaching aerial a rewarding and inspiring experience. She teaches Beginner through Advanced levels of Trapeze and Lyra as well as Act Development and Aerial Conditioning. Jenny was born and raised in Leawood, Kansas and her background prior to aerial arts included performing/competing internationally in many disciplines such as competitive cheerleading, dance, and theater. Outside of Lucia Aerial, Jenny has her doctorate in Clinical Psychology from the University of Kansas, where she specialized in preventative health and neuropsychology. She currently works as a forensic and police psychologist by day, and an aerial instructor and performer by night! She has recently received several awards for contributions to the Kansas City business and arts community, including the 2015 KC Influential Woman Award and was named a 2015 Rising Star in KC Business. Jenny is available for private instruction in Trapeze, Lyra, Silks, Conditioning, and Act Development. Photo by Brent Holzapfel, 2015. Alyss Puhr was born and raised in Indianapolis before relocating to Kansas City about six years ago. She was a competitive gymnast for over 15 years before she attended Purdue University earning a degree in Construction Engineering. After three years as a rock climbing hobbyist, Alyss and her now husband Russ tried an Intro class in November 2012 and fell in love [he actually proposed while on the trapeze]. Well versed in trapeze and duo trapeze, a year ago she resumed training and performing on Lyra. During the day, Alyss is an Estimator for a prominent Construction group where she has also worked on outreach programs exposing hundreds of high school girls to STEM [Science, Technology, Engineering, and Math] careers. When she and Russ are not at then studio, they live in Quality Hill with four kitties and are most likely planning their next Disney adventure. Photo by Alyss Puhr, 2016.